The easiest and quickest way to have a pool slide at home is to get an inflatable water slide. These are not as “exciting” as a Sr Smith or an Interfab but many kids love playing on these kids slide. However, if you want something sturdier and one that the whole family can enjoy using, then check out the inground pool slides for small yards below. Interfab has 2 different slides for small spaces. These are the Zoomerang and the G-force 2 which also happens to be two of their most popular slides. 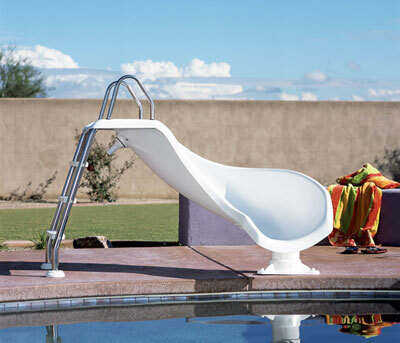 The Zoomerang slide for inground pools requires the smallest footprint at 8′ 0″ x 4′ 0″. It stands at only 3 foot’ high so it can be easily hidden in many 6-foot privacy fence. The Interfab Zoomerang slide is made of long-lasting acrylic construction, it is available only in white with a 200 lb weight limit. The G-Force 2 slide requires a small space of 8′ 6″ x 7′ 2″, and it also has one of the coolest inground pool slide designs. The G-Force slide looks good in any small backyard. It has a flume with a 360-degree configuration. It’s higher than the Zoomerang at 6 feet high. And has a higher weight capacity at 250lbs. SR Smith also has 2 inground pool slides for small yards. These are the Cyclone and the Helix. The Cyclone is a compact style slide that requires a deck space of only 6’8″ x 5’6″. If you have very limited space, you’d want to consider the cyclone slide in your list of possible backyard pool slides. It’s like the large Turbo Twister except it’s shorter. It’s 4′ high with a flume length of 6’10”. It’s available in only right curve. 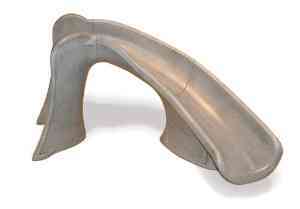 The Helix is a new small pool slide for inground pools from SR Smith. It’s a great design in that it has a 360-degree flume like the G-force and requires a deck space of only 9′ x 5′. The Helix pool slide has a solid sturdy construction and will surely become one of the bestselling SR Smith slides in the coming years. This only has 2 different colors to choose from which are sandstone and gray granite.